"Tell me how you would market our firm if you joined us". Killer interview question or opportunity? "Tell me how you would market our firm if you joined us". No.1 Interview Question for the Recession? Horrible interview questions do not come much worse... I have recently asked this question in a range of interviews for a fairly heavy sales & marketing role and been astonished at the complete lack of ideas that most of the candidates had. It is true that perhaps some people would be wary to give any information for fear of the firm using it without employing them, but so many people do not seem able to grasp the need for sales & marketing at the forefront of most of the job vacancies and interviews currently taking place in the legal profession. 1. Have an idea in your mind of possible opportunities and potential techniques for sourcing work. If you have a look through the back articles in the Legal Recruitment online magazine, it will give you some ideas. 2. Offer to produce a mini-business plan if the firm is interested in you joining them. In that you can identify Strengths, Weaknesses, Opportunities and Threats and this will give you some ideas for suggesting sources of work. 3. Have quick but fairly vague examples backed up with evidence ready, particularly if you have been involved in marketing before. Examples include BNI breakfasts, networking events, speaking to all the local estate agents, joining the local Chamber of Commerce, advertising in small parish magazines, preparing press releases and coming up with legal articles for local newspapers or specialist trade magazines. 4. Be able to give figures for any past performance and any planned future performance. It really demonstrates a business mind if you are able to show actual evidence of your ability to generate work. 5. Be your own salesperson - think about what an employer is looking for at present, and to use business speak - "add value". 1. Do not expect too much. We also advise candidates not to give too much away. 2. Be aware that candidates coming to see you for legal jobs usually expect there to actually be a job, and not to create their own. 3. If you have a "create your own" legal job, make sure you spell this out before the candidate books time off or spends time travelling to see you. 4. If you are planning to offer a very low basic salary plus bonus scheme, spell this out to any applicants as well. 6. If you want a Business Development Manager, recruit one (register the vacancy with us). Don't recruit a lawyer - on the whole, lawyers are lawyers, not salesmen, and the two invariably do not mix. Business Development Managers will spend the whole time sourcing work for you, and are usually happy to take payment on the basis of actual work developed. 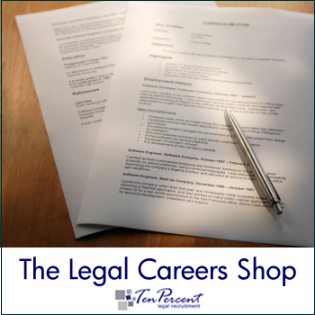 You do not necessarily need one from the legal profession, as ideally you want someone fresh and without preconceived ideas..
Jonathan Fagan is MD of Ten-Percent Legal Recruitment. This article first appeared in the Legal Recruitment News, an online journal - http://www.legal-recruitment.co.uk/. You can visit the Ten-Percent Careers Centre (http://www.ten-percent.co.uk)/ to read more articles or alternatively scroll down the list on the right hand side of this page. Ten Percent Legal Recruitment has been at the forefront of online recruitment since 2000, introducing the UK’s first agency candidate database for law firms to look through and see which candidates we have on the books and to request CVs for them. We have decided for 2010 to introduce a new way of working which probably suits small to medium firms who may be looking to recruit more than once within a 12 month period. For a one of fee we will allow you to contact (via us) as many candidates as you want to through our database, whether by letter, e-mail or telephone, and to recruit without any further charge. The service will not give you direct access to our candidates and it preserves the candidate’s anonymity until they give consent for you to know who they are. Once authorised, you get to see a CV for each candidate as well as a brief description outlining their skills and experience. You can also communicate with the candidate without them knowing who you are and vice versa. For further details please visit www.tenpercent.co.uk/er.html.